A Kyrgyz Rug?...or Band?...or Bands? John Sommer recently showed me a very beautiful and interesting old Kyrgyz weaving which he purchased in Bishkek in 1997. It consists of four sewn-together bands, with asymmetrically- knotted pile and single wefts between rows of knotting. Our discussion inevitably centered on whether this was a tent band chopped into pieces and assembled, or a piece planned as a rug initially and simply made in narrow sections, as some specialists have insisted. The peculiar piecing at one end strongly suggested to John that the format was not original, and that this weaving was made as a long band for wrapping around the collapsible lattice walls of a yurt--a trellis tent. The surprise came when we examined the back more closely and discovered that the sections were from two different weavings! The two panels in the upper left of the photo had a knot density of 68 knots per square inch; the two panels on the right, as well as the two short stubby sections, had an average density of 44 knots per square inch. The warp setts varied from 12 to 15 warps per inch--not the kind of variation that is likely within a single weaving of this sort. Yet no difference was immediately evident on the "rug's" face, and the sections all had similarly lustrous wools, deeply saturated colors, and the same motifs. As we looked more carefully, however, small differences became evident. Medium blues were lighter and brighter in one set of strips, and the more finely woven bands had tiny spots of silk in the design: canary yellow, rose, white and a mottled cochineal magenta. All of the strips had areas of full pile toward the ends, but signs of wear near the center that seemed to have occurred after the "rug" was stitched together. This fascinating piece offers a great lesson: Though it leaves plenty of room for speculation, it should teach us to be exceedingly cautious when we are tempted to assign weavings to different places or times based on varying knot densities and different degrees of weave coarseness. Or even the materials used. Other features have more diagnostic significance. A fascinating HALI article by Murray Eiland suggesting a possible Kirman attribution for a majority of "vase-technique" carpets (No. 100, pages 98-103) prompted me to look more closely at selvages on a few south Persian rugs. I've posted a drawing of one of my findings to challenge anyone who has mastered the zillion selvage variations presented in WOVEN STRUCTURES. Please... if you have not studied that chapter... STOP HERE... This one could drive you nuts. First, some background. On page 42 of WOVEN STRUCTURES, I discussed and illustrated the irregularities that occur with any basic selvage when a weaver alternates two wefts of different fibers or weights. She may simply alter the interlacing sequence at the rug's edge, and encircle the outer warp with each weft. Or she may bind one weft with the other just within the outer warp. (A drawing of this is posted in the section on Chinese Art Deco rugs below.) Or she may simply twist the two wefts together at the edge, and pull the "interlock" inward so that it is protected, as in the drawing at the right. Without one of these solutions, the rug will fall apart at the sides. On knotted-pile rugs, these details are nearly always covered by selvage reinforcing or overcasting yarns. So what can a weaver do with the wefts at the rug's edges when she uses a three-weft sequence? When she alternates wefts between rows of knots in "taut-sinuous-taut" series? Each taut yarn must always use the same shed and each sinuous weft must do likewise. In the selvage drawing at the right, the weaver has twisted the fine, flexible, sinuous blue weft around the heavy white weft so that they interlock; then that stiff white weft yarn has been pulled inward away from the rug's edge slightly. But after alternate rows of knots, no blue weft end is available at the right side of the rug to use for this interlocking. The ingenious Kirman solution: the weaver has consistently interlocked both her blue wefts AND her brown selvage overcasting yarn with the heavy white wefts. SELVAGE: Three warps, overcast with brown wool. The overcasting yarn interlocks with the taut wefts. The interlocking of the ground wefts need not be noted, as some such variation always occurs when two different types of wefts are alternated. So what is the significance of this detail? It is merely one feature to consider along with other characteristics when separating major groups of carpets. But since it demonstrates a distinctive weaving practice, it should carry significant weight. Please let me know what other selvage variations you find on south Persian workshop carpets with 3-weft sequences. Strange as the Persian Kirman selvage above may seem, similar details appear in carpets from other places, including China. Elizabeth Bogen, Alan Arthur and I have been trying to sort Chinese Art Deco carpets from the 1920's and 30's into meaningful groups. We have found that as weavers in these workshops (primarily in Tientsen) attempted to solve problems associated with totally depressed closed back knot constructions, they devised an array of peculiar selvages, some related to the Kirman example. Unlike the Persian weavers, however, the Chinese used just two separate wefts between their rows of knotting. Until the 1920's, white cotton selvages had been standard on a majority of Chinese carpets, and several of the distinctive constructions are illustrated in WOVEN STRUCTURES. Many Art Deco weavers however--including craftsmen in the prestigious Walter Nichols factories--took pride in using separate wool selvage overcasting yarns that were carefully matched to their pile colors. After each row of knots, the weaver interlocked the wool yarn first with his thin, sinuous weft, and then with his heavy, taut cotton weft, as shown in the drawing. 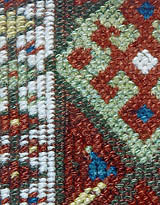 This produced two sets of weft loops along each rug edge. The heavy loops were normally positioned on the rug's front surface; fine loops were most often buried near the rug's underside but sometimes were pulled upward within the construction. Occasionally we find wefts interlocked as well. The overcasting yarn normally makes extra turns around the selvage cord, and these are not shown in the drawing. As long as a rug remains in mint condition, with full pile throughout, this kind of edge is secure, and the weft loops are hidden. 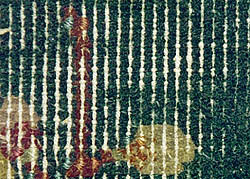 As pile along the side of such a carpet wears, however, the weft loops are exposed, as you see on the black rug at the right. Then the wool overcasting yarns can easily fray, freeing the weft loops and seriously compromising the construction. On a closed back carpet, since pile yarns do not encircle the upper warps (as shown in both the selvage drawing above and the drawing at the left below), the rug's outermost upper warp is also exposed when the pile wears. You can see this white warp distinctly in the photo, as well as bits of the second upper warp. It's a serious structural flaw. Chinese weavers experimented at length, searching for solutions to these problems; we have found at least a dozen variations in the selvages on Deco rugs so far. Some weavers tried symmetrical knots along their left selvages, but this led to more problems. FAR LEFT: Chinese Tientsen closed back knot, in which only the lower (back) warp is encircled by the pile yarn. The upper (front) warp interacts only with the wefts. LEFT: Ordinary asymmetrical knot for comparison. Both knot types are shown with a taut weft and deeply depressed warps. Other workshop weavers used the simpler selvage solution shown in the drawing at the right (shown without an intervening row of knots). These weavers let their light-weight weft bind the taut cotton weft, then used this heavier weft to overcast a thick selvage cord or selvage warp unit. But the inherent problems created by the closed back construction were still not resolved: the outermost regular upper warp was exposed when the pile was eventually worn down along the rug's edge. You can see this in the next photo at the right. Since the pile is so thick and deep in most Art Deco rugs, structural problems usually occur only at the selvages. It may be hard to even imagine how a severely worn closed back Deco rug would look. Well, there's one in a photo below--with the pile worn down to the woven foundation. In this green rug we see just the top set of warps and the fine, sinuous wefts. There are no knot collars on the surface, as there are on a carpet with ordinary asymmetrical knots. The encircled warps and the taut wefts are buried. It would be easy to mistake this for a machine-made carpet. Much more study of Deco rugs is needed if the unusual production of that period is to be understood. I had dismissed these rugs as being of little esthetic merit until I was shown a couple of true masterpieces by collector Jim Jones, and had to quickly recant. These carpets present some intriguing puzzles, and I would be happy to hear from Deco rug collectors. Rugs bearing factory labels or stamps are of special interest. Someone has asked why the closed back structure developed in the first place, and how to identify such a construction. It probably resulted from efforts to produce thicker, more closely set pile. It may, however, simply represent a weaver's error that was perpetuated. We have seen examples of this with other structures in the Near East. This Chinese construction is inherently weak, as the top warp yarns do not interact with the pile yarns, but only with the wefts. The structure is only practical with very long and very densely packed pile--as in most Art Deco production. To identify the structure, separate the pile on the carpet's front and look for small asymmetrical knot collars. If you instead see only white cotton warps and wefts as in the photo above, the structure is the one the Chinese call closed back. Please note: some Deco rugs were made with an ordinary asymmetrical knot construction instead. In a recent review of Woven Structures (HALI 105), Ms. Anne Pollard Rowe raised a few specific questions about structural and technical matters. I'd like to address those points briefly, then discuss her major concern--that Irene Emery's "magisterial" tome, The Primary Structures of Fabrics (Washington, 1966), be embraced uncritically, as the ultimate standard for textile professionals. Because Ms. Rowe's remarks revived a long dormant rug-world controversy, I've provided a link later to an article published during the heated 1980s debate. In my opinion, deficiencies severely limit the usefulness of Emery's work in a few areas, and her abandonment or distortion of practical, centuries-old standard weaving terminology makes cross-cultural translations difficult. Most importantly, her methodology hampers attempts by serious individuals to understand technically- based designing and design evolution. I see these problems as significant for all rug and textile enthusiasts, but critical for textile scholars. Ms. Rowe remarked in her review that she was disappointed that I "did not explain how a fabric with alternately depressed warp yarns was actually produced," then went on to say she "assumed that such a structure results from having one shed fixed open on the loom." There is, however, NO connection between loom mechanics and depressed-warp structures. The fixed-heddle rug looms of Asia--both simple tribal looms and huge workshop constructions--are unfamiliar to some textile scholars, and their operation misunderstood. "Fixed heddle" does not mean that one shed must always remain open. It only means that the heddle bar is braced open (fastened to the loom frame or propped up on a couple of rocks) to form the primary shed, and this heddle bar does not move. Instead, the shed stick does everything. When this rod is pushed far up in the warp (marked "C" in the diagrams), the heddle-bar shed is open. The weaver pulls the shed stick downward (or toward her) half-way to the heddles to close the shed completely. She pulls it down still farther, within the heddle space, to open the secondary shed. When not weaving, a prudent weaver leaves her shed stick in the intermediate position (as in the center diagram), so that tension on the warp does not stretch part of her yarns more than others. Fixed-heddle looms are used throughout all of the rug producing countries--part of them for rugs with depressed warps, others for rugs with no warp depression at all. The basic operation is the same for vertical and horizontal looms. A rug's warp depression or lack of depression is determined solely by the way WEFT TENSION is controlled. If wefts are alternately taut and sinuous, a fabric with depressed alternate warps is the unavoidable result. It's automatic! In the most extreme cases, where one set of warps lies directly behind the other (or below, on a horizontal loom), wefts of quite different materials are often used: a heavy taut cotton cord may be alternated, for example, with a thinner soft wool, cotton, or silk yarn that is packed into place one small segment at a time, allowing plenty of extra length so the yarn can slide down and around the lower warps. A more complete explanation of this appears on page 41 of WOVEN STRUCTURES. This matter hardly requires field work: Any competent weaver can figure it out! Ms. Rowe mentioned the unusual one-warp double cloth technique used by African Sudanese weavers with only a shed stick, one heddle bar, a couple of camel ribs, and a beater. She seemed to be asking if this process might not also have been used for straps in the Asian rug-producing countries. To my knowledge, no one has yet found this technique in use there. The designs in this ingenious version of double weave are picked by hand, of course, and a series of temporary sheds are formed, as in the drawing below. Because this method produces extremely shallow lower sheds--those used for alternate wefts--it is practical for only very narrow bands. Most Anatolian and Persian double-cloth bands are much wider, and the surviving narrow bands that I've seen from those areas have been cardwoven. The most important differences between these techniques are explained in my Chapter 12. Serife Atlihan has been doing considerable field research on Anatolian band weaving, particularly four-harness one-weft double weaves, and I expect that she will be publishing notes on that research before long. I am perplexed by Ms. Rowe's statement, "It is not always evident [in the book] whether 'offset' refers to alternating or diagonal alignment." My guess is that she was referring to offset knotting, although she didn't say, and other structures, such as some kinds of soumak and brocading sometimes have offset features as well. Nor did she say whether she was referring to discussions of structure or design. I can't recall using either of her terms--"alternating alignment" or "diagonal alignment"--in any knotted-pile context. Offset knotting is a structural feature, while in pile constructions "diagonals" are merely a function of design--arbitrary color distribution. In the simplest examples, different warp pairs are encircled by knotted-pile yarns in successive rows. 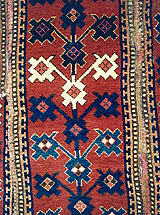 Kurdish weavers have frequently staggered their knots in this way to make smoother, steeper diagonals in their patterning, as in the field portion of the Jaf bag at the right. Turkmen weavers have staggered knots to better articulate small areas of their designs. In tent band structures which combine knotted pile and plain warp-faced grounds, the knots are nearly always offset--automatically. With a shed open, knots are tied on only those warps that are raised--in other words, on HALF of the warps. After a weft shot, the shed is changed for the next row, and knots are tied on the new set of raised warps. Only if an even number of additional wefts are used under and between the knotted rows, as in occasional Central Asian julkhirs, are the knots NOT offset. Diagonal designs are thus encouraged, but slightly ragged vertical elements are easily produced as well. There can be no justification for calling this knotting "diagonally aligned." (Nor should it be called "knotting on three warps!") Nor is "alternating alignment" a reasonable description. These terms fail to identify the most basic characteristics of the structure. Knotting on alternate warps, or knotting on an open shed are standard labels that tell us much more about both the fabric structure AND the technique used. Common offset knotting practices are discussed at length on pages 35-37 and page 52 in WOVEN STRUCTURES; a discussion of tent-band knotting appears on pages 58-60. If anyone can point out specific statements that are unclear, I would appreciate it. Someone has asked why "alternating alignment" is not a good description for tent band knotting--when knots are tied on completely different sets of warps in successive rows. Here's my reasoning: A close look at the finished fabric shows that the tent-band knots are automatically offset by one warp, not two. In the drawing, the first row is knotted on yellow warps; the next row would be knotted on the blue set. Knots are, therefore, not staggered in precisely opposite or "alternate" alignment in successive rows in this structure. That would require that they all be tied on yellow warps and staggered, or all on blue. I have avoided the term "alternating" for any kind of offset knotting because of the possible confusion. A weaver can, of course, stagger the knots from one yellow row to the next, and also stagger those from one blue row to the next--combining purposeful and automatic offsets to make much more steep diagonals. Ms. Rowe has noted that in WOVEN STRUCTURES I have used the term half knot to describe two different things. I think that complaint is valid. My first usage applies to a feature found primarily in Chinese rugs. 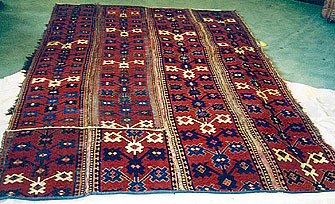 Chinese rug weavers who do most of their coarse knotting with four wool yarn singles together, sometimes tie knots in crucial parts of their designs with just two singles of one color; then they tie another thin knot with two singles of another color directly above the first, without an intervening weft. This sometimes helps to shape curved designs. I have called these small features half knots for the sake of simplicity and clarity, since two of them substitute for one regular knot. Seems logical to me. My second usage, however, makes less sense. In my section on Tibetan knotting, I've explained that with knots overlapping to encompass four warps, the weaver must make special accommodations at pattern edges. I wrote that at such an edge the weaver needed "half a knot" to fill the requisite space and thus produce a crisp color change. It would have been better had I said "a knot half the usual width." Or "a knot on only two warps." Something like that. Common symmetrical knots have often served this purpose. My discussion of Tibetan knotting appears on pages 38-39. The major part of Ms. Rowe's review of WOVEN STRUCTURES was devoted to defending and promoting her mentor's work, Irene Emery's 33-year old volume, The Primary Structures of Fabrics (Washington, 1966). For anyone not familiar with this book, let me summarize: Emery lays out a system for categorizing textile structures by their appearance only, with no regard for the methods used in their production. She and her advocates have attempted to banish all traces of "technical" language and focus instead on terms which they designate as "descriptive," or "structural." Emery's "system" has been accepted in some quarters, but rejected in others by scholars who prefer to use the standard vocabularies of fiber-art literature, expanding and refining the definitions and translations of the CIETA organization (The Centre International d'�tude des Textiles Anciens). To use an example cited by Ms. Rowe, centuries-old weaving terms like "weft" have been assigned new meanings by Emery. In this case, one of the most basic terms anywhere! In Emery's system the word "weft" no longer applies just to crosswise yarns that have been interlaced with the warps on a loom--in other words, yarns usually put through a shed created by the loom. Ms. Emery supposedly saw that standard word as too "technical." So instead of replacing it, she EXPANDED its meaning to include ALL horizontal elements in all fabrics having two or more sets of elements, whether those yarns interlace, wrap, twist, or knot! This is logic? Precision? Clarity? For most of the world, the definition has not changed. Such distortions may simplify museum cataloguing for people who do not thoroughly understand textile processes, but when terms with well-understood and accepted meanings are replaced with some of the Emery labels, translation of textile descriptions into other languages becomes a nightmare. The problems have been compounded. A soumak wrapping yarn that does not interlace is identified by Emery as a "weft" merely because it is horizontal; but then when that yarn follows a diagonal or even vertical path in the fabric, she still calls it a weft! Emery's term "weft wrapping" is actually less logical for soumak structures than the designation "warp wrapping." In the first case, an element that is not really a "weft" does the wrapping; in the second case, the warp is indeed encircled, or wrapped. The term "weft wrapping" most accurately applies when a weft element itself has been encased by another fiber or material. Metallic foil wound around a silk core for a lustrous weft yarn exemplifies true "weft wrapping." The Emery methodology becomes especially annoying when simple wrapped attachments like symmetrical rug knots (one kind of hitch, in knot making terminology), are labeled "extra-weft cut-pile wrapping." Such knots are not in any sense wefts, although other pile fabrics are indeed produced with wefts: corduroy and velveteen for example. The distortion is promoted merely for the sake of convenient pigeonholing. A perceived "consistency" is proclaimed more desirable than logic or accuracy. Brocading is the area handled most inadequately by Emery. A wide variety of brocade weaves have been used by fiber artists around the world, but Emery dumped them all into two overlapping categories: "overshot" and "laid-in." The distinction is confusing because many overshot fabrics also have inlaid features. There are also immense differences between pure pattern inlays and inlaid brocading (the technique used by many Turkmen tent-band weavers). Because the Emery categories are so confusing, most of her devot�s have tended to merely opt for labels like "supplementary-weft-float patterning" or "weft-float brocading"--terms that fail to distinguish radically different fabrics. Most astonishing of all, Ms. Rowe grudgingly admits that the brocade categories I outline in WOVEN STRUCTURES are "useful;" but then she says that they should not be used because they do not apply also to analogous supplementary-warp structures! This, to me, exemplifies the most severe shortcomings of the Emery system: We are advised to slight or ignore structures that do not fit prescribed categories neatly, and just hope that they disappear so nobody notices! Emery dispenses with the vast subject of brocading in just a few paragraphs, and states erroneously that brocading is "the simplest and least restricted way of combining pattern yarns and a ground weave." Brocade structures, however, present severe restrictions for the designer! These limitations are explained in detail, in WOVEN STRUCTURES. Unfortunately, Emery's confusing misinformation has been parroted by many writers. One of Emery's structural mock-ups (Figures 224 and 225) shows a hypothetical structure that simply does not exist in the real world: overlay-underlay brocading with part of her long, floppy pattern floats spanning 22 warps! Floats of this length are possible (though certainly unusual) with inlaid brocading, where each yarn has been placed securely within a shed between pattern areas, but such floats are completely impractical in the structure Emery unsuccessfully attempts to illustrate.